For those who prefer a more luxurious camping experience, we offer Utopia village. Utopia Village is an designated area for Utopia customers only. Located at the festival camping ground, you enjoy 24/7 reception, cafe, tea, place to charge your phone and more. We choose the location, we build the tents, so you have more time to party, less time to worry. The tents are made from Canvas/Cotton, the tents comes in various shapes. Each tent offer the most space and comfort for you and your luggage. with space to stand upright and maximum sleeping space. In the tents you find 15cm high mattresses, bed sheets, sleeping bags and pillows all in all making this a truly worthwhile experience. For extra comfort we also provide you with a bed side table and a lantern. Feel like you want more?! Send us an email and we try to make it happen:). If all you want is a more affordable way to camp and choose your own spot and neighbors,look no further than our classic Utopia Camping DIY Service. After booking at our online shop, simply pick up your order at our service point at the festival, build it up yourself (or with a little help from your friends) and return everything to us in the end. When using the DIY service, you are a big part of our recycling project! The sizes of our DIY tents are quoted according to the manufacturer. If you or your friends are exceptionally tall or come with lots of bags, order up a size! If you find any problems with your gear we are on site at the festival to help you. Keep in mind that this is used gear so don’t expect perfection! Unfortunately, we cannot be at every festival. If you would still like to rent camping gear from us for the next festival, we are happy to help you out. We reserve the gear you need and you pick it up from our warehouse in Berlin. For more information just use our contact form or send us an email! We believe in the oldest form of business, trade! If you own gear in good condition that you don’t need anymore, please bring it to us. We will be happy to buy it or trade for something you want. This way, we can offer more gear at the next festival and reduce the waste left behind. So why throw something away when it could be worth cash and do good? We are interested in anything that is in good condition and belongs to you! We will not accept any items for purchase or trade which we suspect have been stolen. If you prefer money over goods, please note prices have to be negotiable. Waldfrieden, 22-25 Aug 2018 Bergstraße 32, 32351 Stemwede – Wehdem, Germany From August the 22th to 25th the gates to Wonderland will open again at a clearing at the Stemwede mountain. For the 22nd time we are digging this rabbit hole. Every summer in the middle of the woods in-between trees and mushrooms, caterpillars and centipedes the valley transforms into a fairy-tale forest where everything is possible. 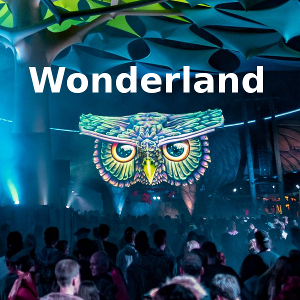 Countless DJs and yogis, artists and shamans will gather to enchant the forest with you. On four dance floors all genres of psychedelic music are played and our open spaces invite for camping on meadows and fields.